New registration process this year! 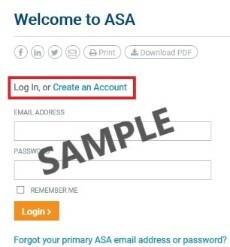 Non-members: Click "Create an Account", and follow the prompts to create a profile. Each person in your group of 3 or more qualifies for a discounted registration fee of $575 per person. Please contact Abby Peskind at a.peskind@asahq.org to receive the group discount code. To qualify for the group discount, all registrants in the group must be with the same institution. Registrations that were submitted earlier or arrive later will NOT be eligible for the group discount, nor will they count toward the 3-person minimum.